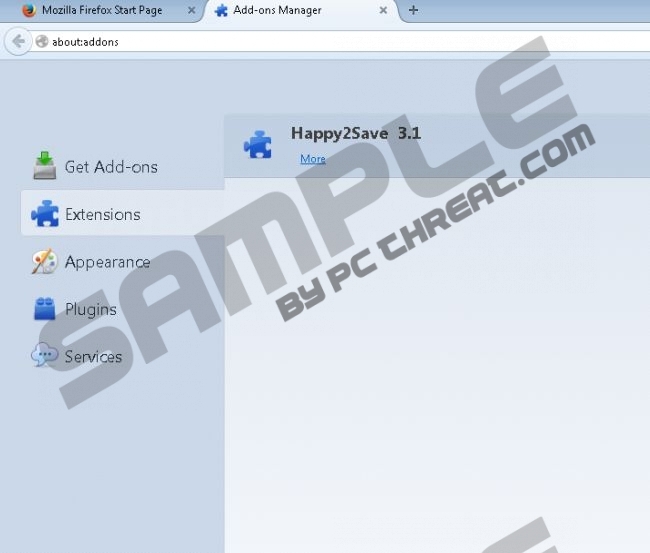 Even though Happy2Save is primarily presented as a Chrome extension, it has been discovered that the plugin could be installed onto Internet Explorer and Mozilla Firefox browsers as well. The official web page representing the program is happy2save.info, and here the application is presented as still in development, which appears to be the reason why the download button does not work. In reality, the extension does work and it comes bundled with other software. Malware researchers indicate that the plugin could be attached to EZdownloader, Websearch.amaizingsearches.info browser hijacker, and other potentially unreliable programs. We advise that you delete all of them after you remove Happy2Save. It is unlikely that you will choose to download the aforementioned software yourself, simply because these applications do not have the best reputation. Nonetheless, you could be introduced to them when downloading bundled software, especially if you choose to use the installRex installers. These are based on the JustPlugIt engine and are infamous for the distribution of UTUobEAdaBlock, YTBlockerApp, and similar suspicious programs. 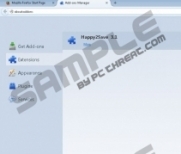 Due to this, we strongly recommend that you scan the computer with a reliable scanner to figure out if malicious programs and adware are running on the PC after discovering Happy2Save. Happy2Save is an advertisement supported program and adware is designed to produce various online ads. Have you already discovered that your web browsers are flooded with all sorts of pop-up, banner and in-line ads when browsing the web? Note that these advertisements are actually presented by third parties who pay the developer of Happy2Save to present different offers. Advertisers always invest money in advertising space; however, when it comes to suspicious, potentially unreliable extensions, we certainly do not advise clicking on the displayed ads or trusting the promoted products. Unfortunately, this could be used to trick you into downloading unreliable software and exposing virtual security to schemers. Happy2Save removal is recommended if you have discovered this suspicious extension running on the web browsers. You can use the manual removal guides below if you want to get rid of the application; however, virtual security researchers strongly recommend automatic malware removal software. As mentioned before, the application can be installed together with other suspicious software which may require removal as well. Some of these programs could even be malicious and hide within the operating system to avoid any disruption. If you do not know how to delete Happy2Save related applications, authentic security software is the best option you have. Right-click on the Metro UI menu background and select All apps. Now open the Control Panel and move to Uninstall a program. Click the Start icon to open the user menu and select Control Panel. Go to Uninstall a program and right-click the undesirable one. Click Uninstall to have the unwanted software deleted. Quick & tested solution for Happy2Save removal.